Leviton Decora SureSlide<sup></sup> dimmers provide smooth, slide-action, full-range dimming for incandescent and dimmable LED and CFL lamps. Featuring a pre-set ON/OFF switch, this device allows the user to set the desired brightness level to operate automatically with the ON/OFF function. The dimmer is designed specifically for dimmable light-emitting diodes (LED) and dimmable compact fluorescent (CFL) lamps; it is also compatible for use with incandescent lamps. Integrated linear full-range slide control for easy, precise operation. Features a separate ON/OFF switch that preserves the selected brightness setting. Single pole or 3-way lighting control when used with a 3-way switch. Slim, compact housing fits easily into a standard wallbox and is suitable for multi-gang installations. Future-proof to control a variety of dimmable CFLand LED lamps. The Leviton DZ6HD is a Z-Wave Plus enabled universal dimmer designed for residential lighting applications. It uses the latest generation of Leviton's dimming technology for smart lighting control, engineered to function with extremely sensitive, low-wattage light sources, such as a single LED bulb in a hallway or a strand of holiday lights, ensuring LEDs do not glow when off. The DZ6HD is fully compatible with Wink, SmartThings and Amazon Echo (requires Wink or SmartThings Hub), as well as all other certified Z-Wave controllers, security systems, gateways, and hubs. Attach one or multiple DZ6HD devices to these controllers to provide automation and remote access. Leviton's IPVD6/IPSD6 Universal Vacancy and Occupancy Sensors combine state-of-the-art technology with new aesthetics to provide optimal management of lighting and motor loads and a choice of either Manual-ON (Vacancy Sensor) or Automatic-ON (Occupancy Sensor) switching. These energy-saving sensors are engineered to control current LED, CFL and incandescent loads and ensure that lights/motors will turn ON manually (vacancy) or automatically (occupancy) and turn OFF automatically when motion is no longer detected within the covered range. All models have screw terminals for easy installation and do not require a neutral wire for connection. The devices feature a time delay setting which allows users the option to delay the lights/motor load from switching off for 30 seconds, 5 minutes, 15 minutes or 30 minutes. Leviton Trimatron lighting controls are traditional rotary-style dimmers that are renowned for their compact, easy-to-install design and outstanding reliability. Trimatron dimmers are only half as deep as many conventional rotary-style dimmers, providing an easy fit even in shallow wallboxes. They are furnished with wire leads to further speed installation. Trimatron dimmers are available in single-pole (one location) and 3-way (multi-location) Deluxe Push-ON/Push-OFF versions for incandescent lighting and fan speed control. The Trimatron line also includes Rotary ON/OFF dimmers and Quiet Fan Speed Controls. Trimatron lighting controls are traditional rotary-style dimmers available in single-pole (one location) and 3-way (multi-location) Push-ON/Push-OFF versions for LED, CFL and incandescent lighting and quiet fan speed control. With a compact, easy-to-install design, Trimatron dimmers provide an easy fit even in shallow wallboxes. The classic style of Trimatron dimmers is ideal for enhancing the décor of traditional homes while simultaneously upgrading functionality to support today's latest bulb technology. 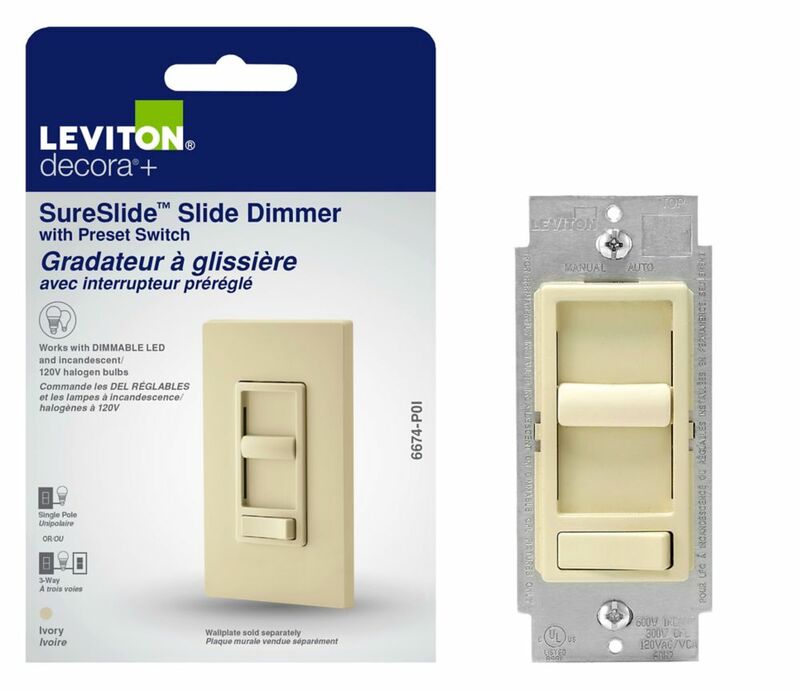 SureSlide Universal Slide Dimmer with Preset in Cream Leviton Decora SureSlide<sup></sup> dimmers provide smooth, slide-action, full-range dimming for incandescent and dimmable LED and CFL lamps. Featuring a pre-set ON/OFF switch, this device allows the user to set the desired brightness level to operate automatically with the ON/OFF function. The dimmer is designed specifically for dimmable light-emitting diodes (LED) and dimmable compact fluorescent (CFL) lamps; it is also compatible for use with incandescent lamps. SureSlide Universal Slide Dimmer with Preset in Cream is rated 4.5 out of 5 by 66. Rated 2 out of 5 by Husker2 from Emits substantial radio interference on any power setting.... Emits substantial radio interference on any power setting. Rated 5 out of 5 by TomN from Easy clear install instructions, looks great!... Easy clear install instructions, looks great! Rated 5 out of 5 by Richard from Easy to install. Smooth operation.... Easy to install. Smooth operation. Rated 4 out of 5 by Hammer from I needed a pair and found this available is stock. Works fine. I needed a pair and found this available is stock. Works fine.